What’s the difference between living in America and being American? 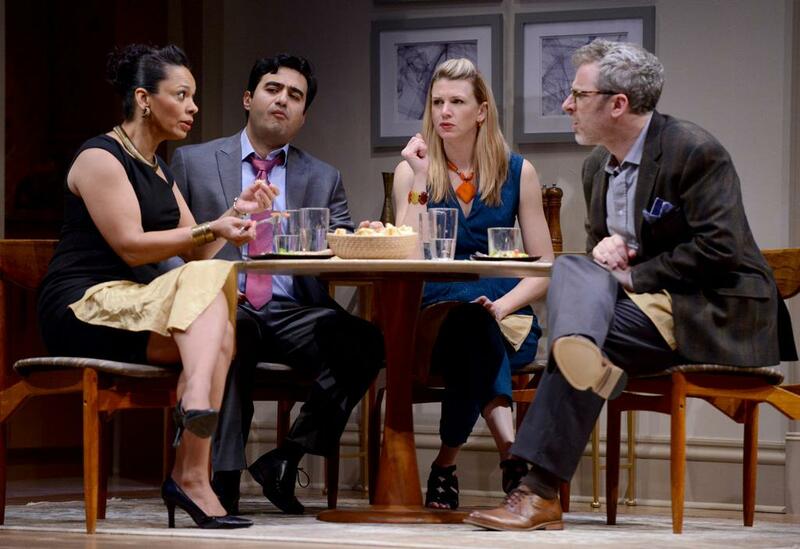 Ayad Akhtar’s 2013 Pulitzer Prize winning play “Disgraced,” which debuted at Pittsburgh Public Theater March 10, and runs through April 10, breaks down the complexities behind citizens’ dual identities. The one-act play, led by City Theatre’s Artistic Director Tracy Brigden, follows characters living in New York City with multiple identities. We meet a Pakistani-American lawyer Amir, his wife Emily — a white American artist focused on the Islamic tradition — an African-American attorney named Jory and her Jewish husband Isaac. Complications arise when Amir testifiies in favor of a local Muslim leader after they are arrested. At a Manhattan dinner party, the characters voice their inflexible ideas of each other in light of his testimony, revealing their inherent biases and insecurities with religion and politics. Centered on the dinner party’s conversation, the characters’ clashing ideologies make for an increasingly tense meal. As a dialogue-driven performance, “Disgraced” explores how our backgrounds and upbringings form our inherent biases and perceptions of each other. Actress Lisa Velten Smith, who plays the white American artist, said every audience member could walk away with a different interpretation. “This is going to touch people depending on how you grew up, your viewpoints, on your acceptances and prejudices, on what happened to you that day, what happened in the news that day,” she said. Characters in the play debate Islamic terrorism and land on varying Quran interpretations. Their contrasting views implore the audience to question how their own unconscious biases, like the characters’, form unjustified conclusions. “Watch out for your own prejudices — see if you have any. The play is great at revealing that,” said actor Fajer Kaisi, who plays Amir. The play’s ambiguous purpose touches on that variability in how we form our ideologies — from immigration to the way we interact with strangers and friends alike. To Velton Smith, the play’s stength lies in the way it doesn’t cater specifically to one group or another. “You need to sit there in those seats and absorb and witness these human beings on stage and navigating their journeys and decide for yourself what you take away,” she said. For actor Justin Ahdoot, who plays Amir’s culturally assimilated nephew Abe, the characters’ moral ambiguity stems from the idea that there is no objective way to measure a person’s reaction as right or wrong, but rather as a reflection of their personal values. To Ahdoot, the play’s deliberate character framing portrays a relatable cast of characters that drives home an important message. “I want people to take away that when they’re watching this that just because a person is a certain type of race or identifies with a certain ethnicity, they don’t speak for the entire race or ethnicity,” he said. Despite its open-minded sentiment, the play does not instruct its viewers in what to think about its characters, or the more sensitive topics it presents, like the state of contemporary Islam and international terrorism. “I’m excited about this play because if you go in with five people you will come away with five different perspectives,” Velten Smith said. “Disgraced’s” divergent opinions don’t offer a clean resolution. This is “Disgraced’s” beauty and purpose.